Motor-in-roller design, for smooth, quiet operation. Targa�for beauty and reliability. Draper�s motor-in-roller design allows viewing surface to be centered in case for a trim, balanced appearance. The motor is mounted inside the roller on special vibration insulators, so operating noise is dramatically reduced. The Targa operates instantly at the touch of a switch. Stops automatically in the �up� and �down� positions. Screen is housed in a one-piece steel case finished in dove grey (standard), black, or white. Choice of fiberglass matt white, glass beaded, or optional Panamax viewing surface. The Targa is also available with acoustically transparent At1200 viewing surface, for situations where speakers need to be installed behind the screen. All viewing surfaces are flame and mildew resistant. Three-position control switch included. Optional controls are described on page 19. 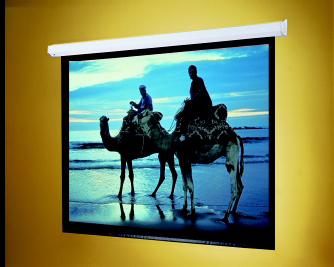 Extra Drop- Up to 12' overall height, either white or black (White is standard for AV format; black for all other formats). Black Masking Borders-Borders are optional for AV format, standard for all other formats. Case ColorGrey (standard), white, or black. Control Options - Refer to page 19 for complete descriptions of control options..